After exiting the Free Water Knockout (FWKO) system‚ the partially dehydrated oil-water emulsion is fed into the Heater Treater process by charge pumps. 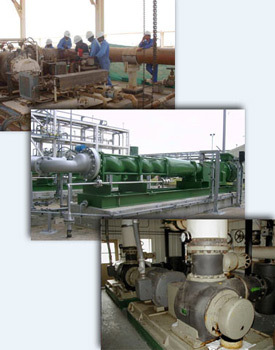 The Heater Treater system consists of a pressurized vessel‚ or a series of pressurized vessels‚ in which a bottom-mounted heat source is operated‚ fueled typically by natural gas. The incoming well-mixed oil-water emulsion is heated by means of its direct contact with the aforementioned heat source. The ensuing temperature increase reduces the molecular attraction between the oil and water molecules‚ permitting the water droplets to settle out more rapidly. To increase the efficiency of this process‚ other mechanical and gravity separation methods are often employed. To provide adequate time for effective separation of the oil and water‚ a longer retention time is required within this upstream system. The dehydrated crude is then delivered under pressure to the desalter system. As experience bears out‚ Heater Treater Charge processes have their challenges. The basic operation of the system is designed around reasonably steady-state production conditions. In reality these seldom happen. Both high and low flow rates adversely impact the ability of the oil-water emulsion to effectively separate. Similarly the incoming crude at times has not been suitably de-watered‚ which demands additional energy to heat the fluid‚ due to the increased volume of water and its greater heat capacity as compared to oil. From a charge pump standpoint‚ the fluids being managed are highly viscous emulsions. They are typically being delivered under very challenging and dynamic suction conditions‚ due to the frictional losses between the outlet of the FWKO system and the inlet to the Heater Treater system and varying production demands. Upstream facility managers and operators around the globe have realized that volumetric‚ rotary PD pumps are something they can capitalize on in these services. Having a machine that can reliably handle variable inlet and outlet conditions with non-homogeneous‚ gas-laden (sour and sweet)‚ and contaminated‚ viscous process fluids is critical. These strengths‚ coupled with the tremendous turndown flow capabilities of rotary PD pumps‚ make them an ideal fluid-conveying solution for your oil-water emulsion treating systems.